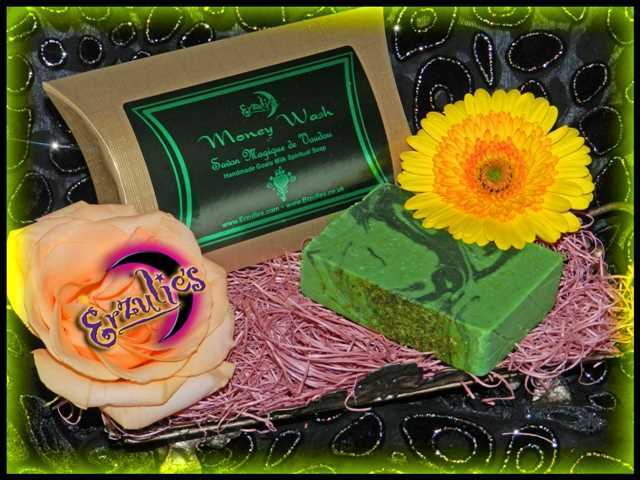 About Organic Goats Milk Spiritual Soaps at Erzulie’s! Organic Goats Milk Soaps, Natural Goats Milk Soaps and Handmade Goats Milk Spiritual Soaps! 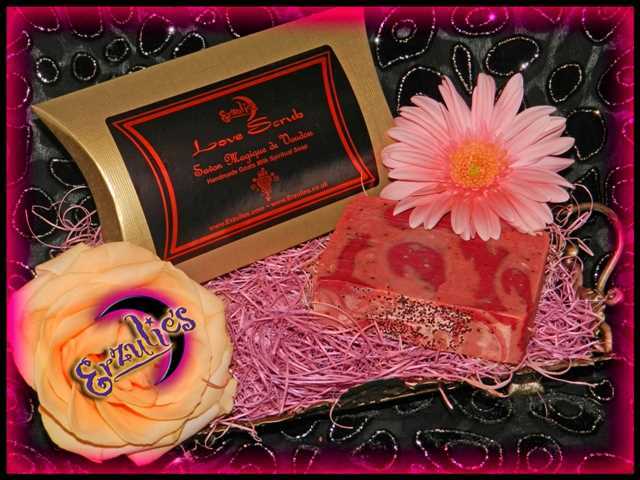 Erzulie’s is quite renowned for the finest, most natural and organic ingredients that go into all of our products, particularly our Handmade Goats Milk Spiritual Soaps. 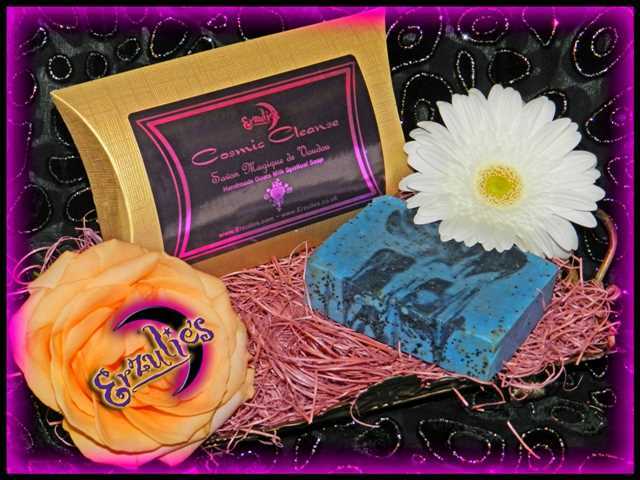 We thought our customers would like to know a little more about how these exquisite soaps are handcrafted and why Erzulie’s goat’s milk soaps and Voodoo Spirit ™ Goats Milk Soaps are the finest we’ve ever seen. formulary, the finest organic ingredients and the most precious oils in the world, there is a real science behind crafting handmade Goat’s Milk Soaps that few have mastered, with the help of our on-staff Master Goats Milk Soap Crafter, we are happy to provide you the following information on our natural handmade soaps.What makes natural soaps so great? Essentially, it is the artificial ingredients they lack: artificial hardeners, whiteners, detergents, chemical surfactants, and synthetic perfumes. Handmade goats milk soaps are in a category of their own and because they are all natural, they do possess the energies and life force of the very roots, herbs, plants and essential oils they are made with to insure spiritual connection, which is the primary purpose for our handmade goat’s milk soaps. We truly believe Spirit and specifically the Lwa, do not resonate with man-made chemicals or synthetics. Additionally, they bring you back to a sacred time when things were pure and simple, when people were in touch with nature, the cycles of the seasons and deep reverence for Spirit. Wholesome vegetable oils, organic goat’s milk, rain, and plenty of organic botanicals are carefully measured and blended to preserve their skin-loving properties as well, so natural soaps are not only the best for your spiritually, they are the best for you psychically as well. Stirred by hand and allowed to rest for at least 24 hours, these goat’s milk soaps contain a high percentage of glycerin, humectants and natural byproducts that draws moisture to your skin as you bathe. Cured for several weeks, the natural soaps harden and the pure essential oils, organic roots, herbs and plants mingle; you will notice a fresh burst of plant essences every time you lather. Natural Soaps or “Old Fashioned” or “True Soaps” are all made from are made from three basic ingredients: oil or fat, water, and an alkali. The water dissolves the alkali and allows it to bond with the oil molecules, creating a new component: soap. As with any chemical reaction, a certain amount of heat is needed to get the reaction going, and the reaction itself creates heat. The soaps we make at Erzulie’s are handmade with what is called the “cold process method” the most authentic and challenging we may add! This means that we do not apply any external heat once the ingredients are blended together. This process relies on the heat generated during the chemical reaction – called Saponification – to complete the process. Some soap makers “cook” their soap; we call this hot process. The hot process method causes the alkali and oil molecules to bond quicker, thus speeding up the Saponification process; however, this method results in soap that has a different texture than cold process soap, due to the extra water used and the stirring that takes place while the soap cooks and thickens in the pot. In the cold process method, the ingredients are blended and stirred until it reaches a certain point which we call “trace.” This is the point at which the Saponification can continue on its own without risking separation. The still-liquid soap is then poured into wooden molds where it sits for at least 24 hours. The wood molds help to insulate the soap and retain the heat created during Saponification. into soap. Should the soap mixture gets too hot while in the mold, the soap can separate or curdle, so the temperature is maintained by the amount and type of insulation used (typically towels or blankets). The soap molds are left in a draft-free area with a controlled humidity level to aid the process. Timing, temperature and curing is the key to producing the highest quality goat milk soaps. Speaking of goat’s milk soap, here’s a little more information as to why Erzulie’s Natural Goat’s Milk Soaps are made with Goats Milk! Goat’s milk is used in Erzulie’s natural soaps because of its authentic magical properties, and special physical properties, including lipids that help seal in moisture and caprylic acid that helps maintain skin’s natural pH level. If you want to get more technical, in comparison to cow’s milk, goat’s milk has shorter strands of proteins and triglycerides, which are easily absorbed into the skin. This molecular structure makes goat’s milk soaps more moisturizing and gentle enough for all skin types. We blend the soap at low temperatures to preserve the natural vitamins, minerals and proteins present in goat’s milk; these components also contribute to the creamy lather that you will experience. 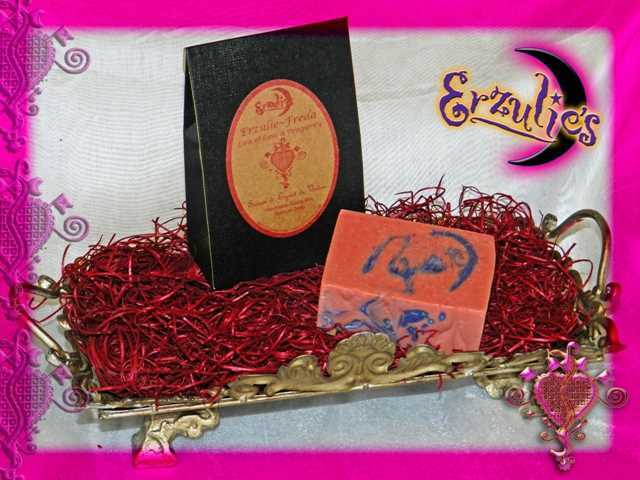 Every batch of Erzulie’s natural goats milk spiritual soap is handmade based upon authentic Voodoo recipes and formulary, in small batches, poured into handmade wooden molds, hand cut, and allowed to cure & dry for several weeks. The only machines involved are a digital scale to ensure accurate measurements, and a stove top to melt the cocoa butter. Due to the natural aspects of the ingredients and this “human factor”, every soap bar is unique. Large organic botanicals like lavender buds, rose buds, roots and herbs are ground for a more gentle texture while others are left whole to preserve their characteristics. Pure plant essential oils are added for their many magical, spiritual and aromatherapy benefits; each scent blend is carefully balanced to ensure crisp top notes, a long lasting middle note, and grounded base notes. Minerals and clays from the Earth are used to color each goat’s milk soap, in addition to botanical infusions, seeds, spices, and herbs. The result of all these components is an exclusive combination of pure essential oils, moisturizing goat’s milk, and rare botanicals that you will not find anywhere else.